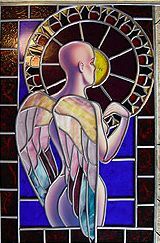 Tonight's presentation is on leaded glass panels with painted elements. I'll start with start up costs and some safety information. 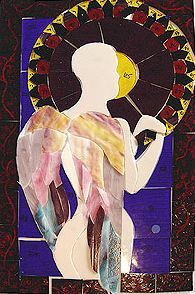 If you are interested in experimenting with stained glass, I highly recommend taking a class. 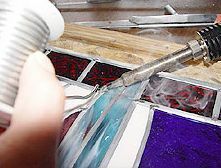 Most glass shops offer classes with free use of their equipment and some supplies. 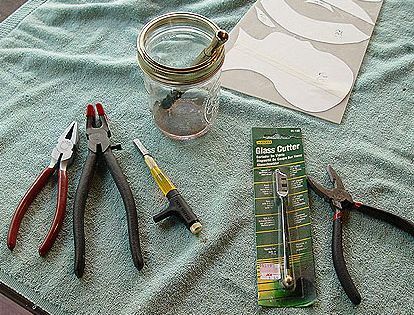 If you go that route, you can begin by buying only an inexpensive cutter, ($4 or so at any hardware store). If you want to "do it yourself", you should also buy a pair of breaker/grozier pliers, grinder, lead knife and soldering iron. 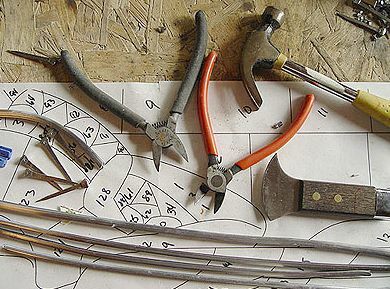 You can purchase the tools you need to get started for $150 or less. Plan on spending at least $10-$15 per square foot for glass, lead and other materials. 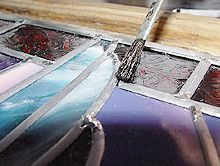 The glass itself will cost anywhere from $5 per square foot to well over $50 per square for top of the line art glass. 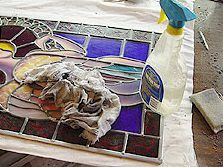 Stained glass has several hazards associated with the process, but fortunately, all are easily avoided with some simple precautions. Small cuts from the glass are to be expected; keep bandages handy. Large or deep cuts are infrequent and nearly always happen when handling or moving the glass; not while working with it. 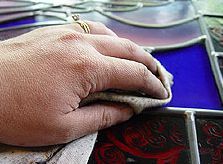 Until you are accustomed to handling glass, it may be a good idea to wear gloves. Break the glass away from your body. Wear safety glasses when grozeing, (explained later), and grinding. You can only get lead poisoning by ingesting the lead. Which means - don't eat it! Don't eat, drink or smoke while handling the lead. 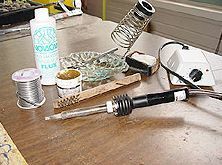 When soldering, be sure you are in a well ventilated area, as flux fumes are very toxic. The first step in creating your piece is the pattern design. I always start with a series of sketches. I don't worry about whether the sketch will "work" in glass to start. The biggest mistake I see in most glass designs is an over attention to shapes and not enough emphasis on line. 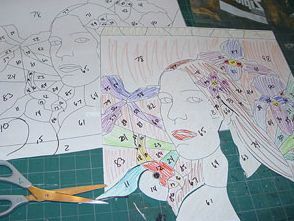 Once you like the sketch, start looking at individual shapes to see if they can be cut in glass. Sharp inside angles, curves that go into a closed "C" shape and hourglass shapes are either impossible or structurally unstable. Adjust as necessary. Once your design is ready, duplicate it, number the individual shapes on both copies and mark the color and grain direction on the copy to be cut. 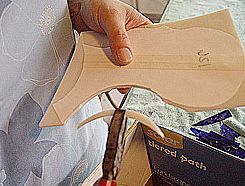 Then, using 3 bladed pattern shears, cut the pattern. 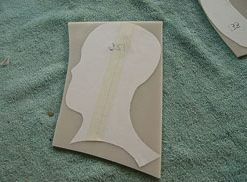 Once the pattern is cut out, use rubber cement to position the pattern pieces on the smooth side of the glass. 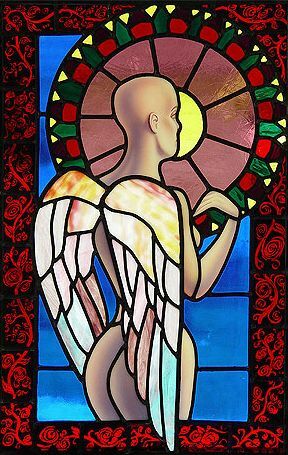 There are two basic kinds of stained glass; cathedral, which is translucent, and opalescent, which has white mixed in with the color. Opalescent glass diffuses light and tends to give a much more painterly effect. It also has more visual "weight" than cathedral glass. Art glass comes in dozens of textures from perfectly smooth to heavy drape-like folds. Heavy textures can make a panel more rich and interesting, but also tend to be more difficult to cut, resulting in more waste. Cutting glass consists of two steps; scoring and breaking. To score the glass, hold the cutter in your dominant hand and support it with your other hand. 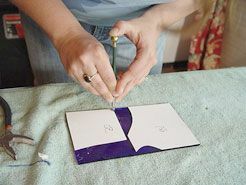 Hold the cutter at 90 degrees to the glass, and roll it along your pattern with light pressure, (3-5 pounds). Keep your elbows in to your body and your eyes directly over the cutter. This creates a series of tiny close together chips, or a score line. The next step is breaking. How you break depends on the kind of cut. Straight cuts or shallow curves can be broken by hand. Keep your knuckles in and exert even pressure on both sides of the score. Curves are best broken with a pliers. Glass will naturally break in a curve extending down both sides from where you are applying the pressure. Position the pliers at the apex of the curve and firmly pull down, while supporting the other side of the score with your other hand. Protrusions or excess glass can be removed by grozeing. By scraping the curved and serrated edge of the grozier across the edge of the glass with even pressure, it essentially grinds off the excess. Do not do this near your face as breathing glass dust is hazardous. 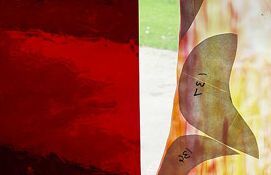 Deep curves and complex shapes can be broken by making a series of shallow curved scores and breaking out one at a time. Once all your pieces are cut to the pattern, it is time to grind. Gently swipe the glass along the grinder bit, (be sure the sponge is good and wet), until the glass is ground exactly to the edge of the pattern. 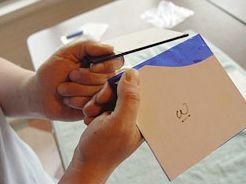 This is tough on fingertips, so you may want to wear gloves or those little "finger condoms" available at office supply stores. Arrange all your glass pieces in order to be sure they fit, and you're ready to paint! I use oven fired Pebeo paints, available at most craft stores. Be sure to buy the extender along with your paints. For the borders I did a very simple but effective technique used extensively during the Middle Ages. 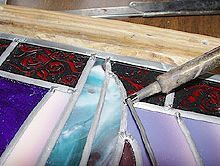 Apply a heavy coat of black on a piece of cathedral glass. 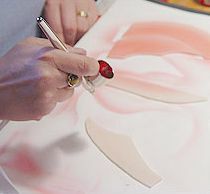 Create design elements by removing the paint using a sharpened dowel, pencil eraser etc. Once the border is painted, set it aside to dry for a good 48 hours. Border effects are created by laying a heavy layer of black on cathedral glass then removing paint in a free-flowing design. Painted pieces are dried for 48-72 hours and baked at 315-320 degrees for 40 minutes. The figure is pained in 3 steps. 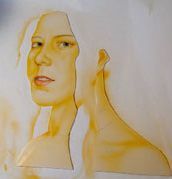 First, make sure the glass is clean and free of oils, then brush paint the facial details. For this piece I'm using a simple palette of only red, blue and yellow. Next it is time to airbrush. I'll start with a layer of red paint. 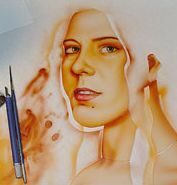 Mix paint, some extender and water in the bowl of the airbrush until it is about the consistency of milk. 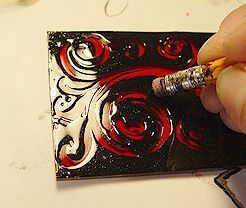 Do a few practice sprays to be sure the paint flows out evenly without clogging or spitting, then begin to lay on very thin and dry layers for the mid tones and shadows. 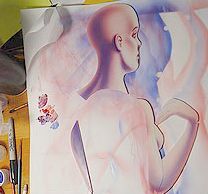 It takes some practice to control the finger motion, (pushing down and simultaneously pulling back), that controls the amount of air and paint released from the airbrush. Start the paint on the paper and move on to the glass, then off again, in the direction you want the "line" of the color to go. This will ensure an even blend without a dark spot where you begin the painting. Keep building up color where you want the darkest shadows. This takes a lot of patience. 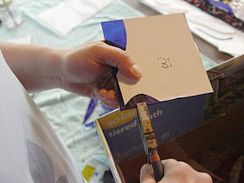 But if you keep the layers thin and dry, you can avoid splotchy uneven spots. After finishing the base color, I'll clean out the airbrush and start to spray the blue for deeper shadows. 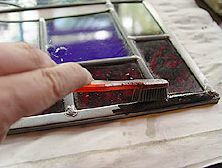 For this part, you hold the brush closer to the glass and release a bit more paint. Start where you want it the darkest, and the over-spray will blend with your first layers for smooth transition of color. 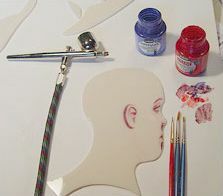 I'll also use the blue to pick out more detail in the face and around the ear. Then I'll clean the brush and spray just a bit of yellow on the highlights, clean again, and spray all the pieces with a combination of the clear extender and water to make the surface even and glossy. Finally, once all the airbrushing is completed, use a brush to strengthen any details that have gotten too "fuzzy" during the airbrushing. 1. Materials for painting: Pebeo Vitrea paints in red, yellow and blue, Pebeo extender, fine brushes, airbrush, air compressor and water. Detail is first brush painted. 2. Applying first layer of red to define shadow and highlighted areas. 3. 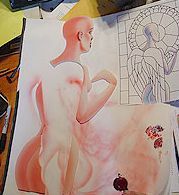 After first color application, with prismacolor reference to the right. 4. 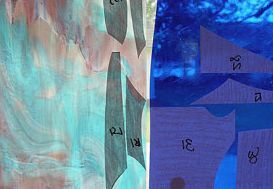 Blue is applied to deepen shadows and define the form. Let the paint dry for at least 24 hours, then bake it in the oven at around 320 degrees for 45 minutes. Put the glass in the cold oven, set the temperature and timer, and after 45 minutes, turn off the oven and let the pieces cool before removing them. 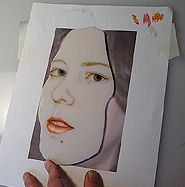 Portrait painting has a few more steps. I put the reference photo in Photoshop, increase the contrast, and adjust the size to exactly match the piece of glass that will be painted. I then print the photo and position it on a lightbox with the glass positioned on top of it. 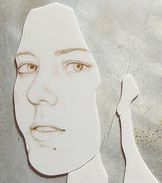 I trace the facial features lightly with a brush in a neutral color, then start to layer on more paint and color. 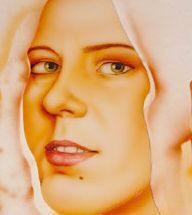 The airbrushing is done as explained above with the reference always close at hand. Finally, the features are sharpened and/or darkened up as necessary. 1. Initial linework lightly painted. 2. 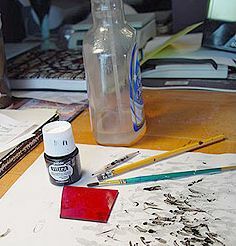 Linework and brush painting defined (painted on top of reference, taped to a lightbox for accuracy). 3. 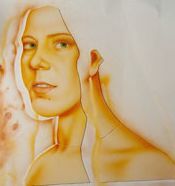 First application of airbrush in honey/amber. 4. Second application of airbrush in a golden reddish brown. 5. Details intensified with additional brush painting - lines sharpened by removing paint with exacto knife. 6. Finished portrait. Horseshoe nails and "stop blocks"
Position the un-cut pattern on a work surface with a square corner, then cut your "U" border lead, or in this case zinc, for two sides, leaving some extra length beyond the edge of the pattern. Stretch the lengths of lead you will be using for your project to straighten out any kinks using a bench vise and pliers. 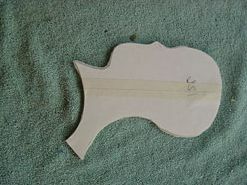 Once the piece is leaded, you may notice that the glass has shifted in places, leaving gaps between the lead. This is undesirable, but can be remedied by cutting the bottom leg of the H lead off, creating a "T" lead. Use T lead to fill any gaps. 1. Stretching the lead. 2. Wrapping a complex piece. 3. Nipping lead. 4. 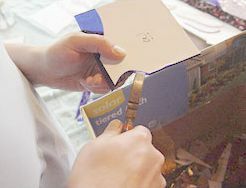 Cutting with lead knife. 5. Partially leaded - with "tails". 6. "T" lead filling small gap. To prepare the piece for solder, use a brass wire brush to clean off all the joints, then apply liquid flux to joints with a stiff brush. Heat the iron then lay the solder across your joint at an angle. Press down with the iron, using a slow even straight down motion. The solder will melt and spread, then begin to contract. Lift the iron with a smooth straight up movement as soon as you see the contraction of the melted solder. Don't leave the iron on too long or you will melt the lead! And don't jerk the iron or little molten balls of metal will fly off the tip, burning holes in perfectly good clothes, (and skin)! Solder all the joints on the top of the panel, spray with glass cleaner to neutralize the flux, and carefully flip the panel. Solder the other side, clean off the flux then run it to a window to see what it looks like! 2. After cleaning joints with a wire brush, apply flux. 2. Mix ingredients to the consistency of gravy. 3. Smear all over panel, pushing under the lead leaves. 4. Cutting with lead knife. 5. Rub off excess. 6. Brush putty off the glass, being careful not to remove from under the lead. 7. 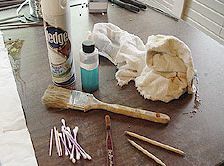 Using toothpicks or a sharpened dowel, clean up excess putty. Last step! Clean-up consists of 3 basic steps. First, clean the panel well with ammonia based cleaner or even straight ammonia if you can handle the fumes. Scrub with a soft dish scrubber and dry well with a lint free cloth. Then apply patina if desired. This is simply a chemical oxidizer that darkens the lead and solder. It will darken on its own over the years, but I like to speed the process up a bit. Wipe well with a water dampened cloth. Finally, apply wax, and buff until the glass and lead are glossy. 2. 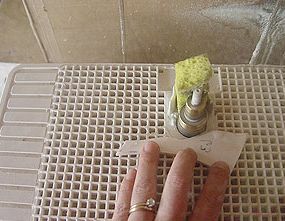 Wash panel with ammonia or ammonia based glass cleaner. 3. Apply patina. 4. Apply wax with a soft cloth, then buff with a clean cloth. Use Q-Tips to buff tight spots. Place in a window and enjoy!